Wow, you’re going to learn a lot from this interview with UVA undergrad and now Bain consultant, James. His first recruiting season left much to be desired, but he learned his lesson and turned it around for interviews his senior year. With offers from Bain and BCG, James shares with MC readers his first-hand experience with the interview process (read more about case interviewing), the importance of practicing cases with a partner, and advice for breaking into MBB. I’m a recent graduate of the University of Virginia (UVA) with a BS in Commerce and a minor in History. In the fall, I’ll be starting work full time as an Associate Consultant (AC) at Bain & Company. I’m really excited to begin work and to have the opportunity to spend a few years (or more!) providing strategic advice and results to companies in different industries and across a wide range of functional areas. During my four years at UVA, I was very involved with Madison House, the student volunteer center on campus, serving as head program director for a volunteer income tax assistance program. I also spent two years working part-time at a university-affiliated research organization. Outside of UVA, I interned in the corporate trust division of a commercial bank in Pennsylvania the summer before my junior year, and in the technology division of a large investment bank in New York the following summer. Despite the diversity of these experiences, two job functions I encountered in all of them were group-based problem solving and project management—definitely key elements of the consulting toolset. In my free time, I enjoy playing golf, cycling, and watching the Pittsburgh Steelers—not to mention trying to catch up on a never-ending reading list! 2. When did you first become interested in consulting? To fully explain my interest in consulting, I have to give some background on the undergraduate business curriculum at UVA. UVA’s undergraduate business school (the McIntire School of Commerce) is only a two-year program, but a very rigorous and comprehensive one. In the first semester at McIntire, you are assigned to a block of 30-40 students and as a class, you rotate through seven different functional areas of business—strategy, information systems, finance, marketing, organizational behavior, communications, and quantitative analysis. At the same time, each student is placed into a group of 5 and assigned a semester-long project (closely resembling a consulting engagement) for a corporate sponsor, meant to incorporate all seven subject areas. Going into McIntire, I was like every other undergrad business student who has seen Wall Street and can recite the “Greed is Good” speech verbatim. In other words, I wanted to be an investment banker. But as I worked with my group on our semester-long project (our objective was to develop and launch a new product or service for a large computer manufacturer), I realized that when it came to finance, 1) I was not especially good at it and 2) I found it to be incredibly boring. Instead of chasing that dream, I changed course to where my strengths and interests converged: strategy. I loved the combination of the creative and the analytical, and the need to synthesize every piece of information to find the best possible solution really spoke to me. When I found out that this is what consultants do, I knew I had found my niche. Combined with the opportunity to learn so much so quickly coming right out of school, I seized onto consulting and haven’t looked back. 3. You shared with us that your story is a “Cinderella story.” What obstacles did you face in the process, and how did you get invited to the ball, so to speak? Consulting recruiting is certainly not a fairy tale, although I suppose some case interviewers can be as bad as (or worse than) the wicked stepsisters (kidding, of course). To explain your metaphor a bit more, I was not at all ready when it came to the internship recruiting season. I asked for Case in Point for Christmas (nerd alert!) and glossed over it a few times in January and February of my junior year, in addition to looking at a few frameworks on caseinterview.com and going through the video cases on the MBB recruiting websites. That spring, I was invited to interviews with Bain and BCG for which I was woefully underprepared. Needless to say, I didn’t make it past the first round with either firm. While I was working that summer in New York, I promised myself that I wouldn’t make the same mistakes when it came to full time recruiting. I kept in contact with a few key contacts over the summer, and as soon as I got back to school, I asked two of my friends who had also interviewed with MBB firms (and similarly didn’t land internships with them) if they’d like to do live case practice a few hours a week. That was the key for me. 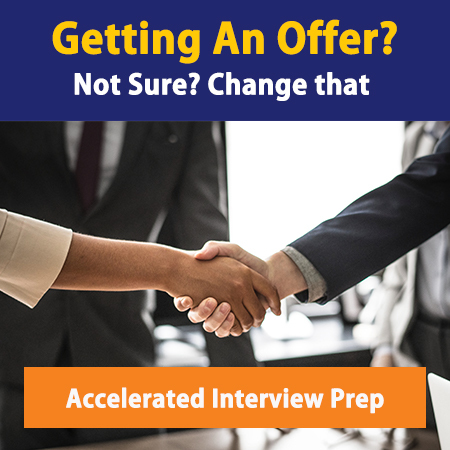 There are plenty of consulting club casebooks available online, and giving (and receiving) live cases teaches you how to approach the case interview process in a way that nothing else can match. At the end of September, I had my shot(s) at redemption: interviews with the same two firms who had seen me fumble my way through their cases seven months earlier. This time around, things went a lot better and I received offers from both Bain and BCG, ultimately choosing Bain. 4. Bain is recognized as one of the world’s top consulting firms. Can you tell us the insider’s view of the interview process (how many interviews, what types of cases, etc.)? My first round interview for Bain (held on-campus) consisted of two back-to-back 30-minute case interviews. I wasn’t asked about anything on my resume nor did I face any behavioral questions—it’s all about the case. My second (and final) round interview was conducted in-office and was comprised of three 30-minute case interviews (requiring deeper analysis than the initial interviews) and one 30-minute resume-based/behavioral interview. The in-office super day is a bit rigorous and you’re guaranteed to think you completely bombed at least one of the cases, but apparently, that’s par for the course. The cases covered a wide variety of industries (technology, entertainment, manufacturing, etc.) and topics (profitability, sales strategy, etc. )—there’s no “favorite type” of case. 5. Looking back now, what do you wish you would have known/done when you were going through the process? Obviously, I wish I would have done everything I did right during the full time recruiting process one recruiting season earlier. It would have been great to work as a consulting summer intern and not have had to worry about the fall recruiting season. I guess I also wish someone would have just told me that live case practice is the best preparation—I can’t tell you how crucial this is to increase both your skill and your confidence. I found out the hard way that reading cases is just not the same. 6. You got offers from BCG and Bain (and perhaps others). Why did you decide to join Bain? It certainly wasn’t an easy choice, and I definitely spent a few weeks analyzing my decision. However, I have to say that Bain’s results-oriented approach really appealed to me. While I certainly enjoy the theoretical and academic side of problem-solving, at heart, I’m a very practical person. Bain’s approach seemed very much in line with the way I think and work, more so than some other firms. However, the factor that may have influenced my decision to join Bain more than any other was simple: the people. Throughout the entire recruiting process, I had more opportunities (information sessions, coffee chats, bar nights, etc.) to meet people from every level at Bain than any other firm. Perhaps more importantly, I felt they got to know me as a person, not just another applicant. I could tell that Bain really cared about its employees—even its future ones. In addition, I found Bain’s “pyramid” structure (greatest number of employees are undergraduate hires) slightly more appealing than BCG’s “diamond” structure (greatest number of employees are MBA hires)—I felt the increased focus could only benefit me in the first few months on the job. 7. What advice can you give MC readers about breaking into Bain? Find a friend with whom you can practice live cases. Get good at it, from both sides of the table. You’ll learn a lot very quickly, and there is nothing better you can do to prepare. At information sessions, quality trumps quantity. Have one or two good conversations. Know the lingo, and use it when appropriate. Ask for a card and follow up. Mention your conversation and contact in the cover letter. And thank the recruiters every time you see them—they hold more influence than you think! Have one or two solid frameworks you can adapt to nearly every case. You’ll find what works for you. To succeed in case interviews, you need both solid analysis and articulate presentation—not one or the other. Humility is underrated. Acknowledge your mistakes and learn from them.